Last week I shared a book review with you. I will be writing a new review about something (probably books) every month as a returning segment called ‘The Review‘. This week I want to introduce another recurring item: ‘Going places‘. 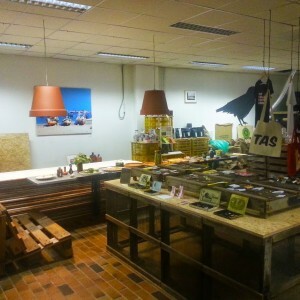 Stroop is a pop-up café near the centre of Rotterdam. 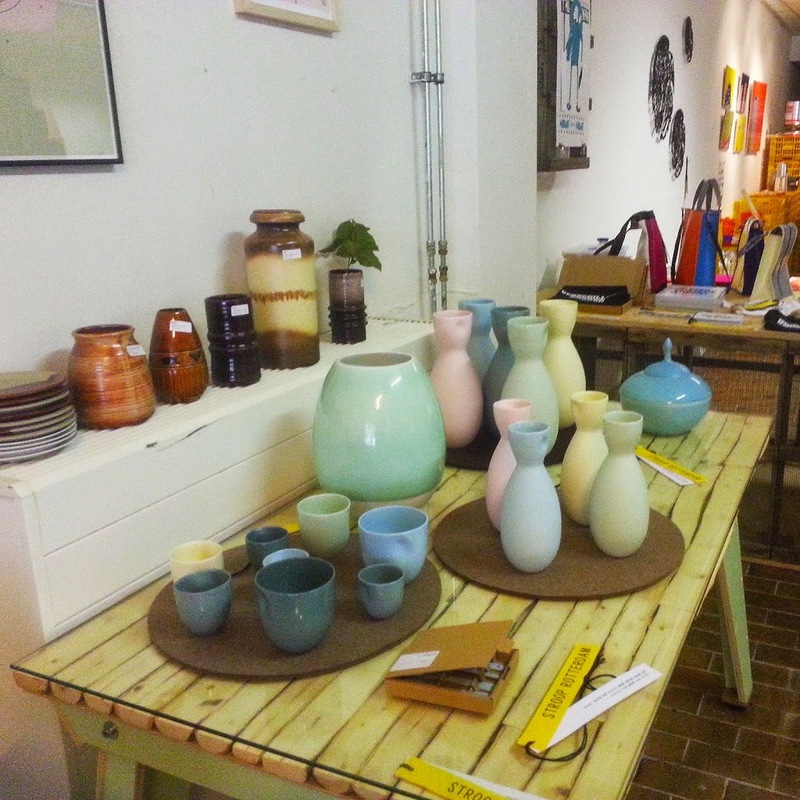 It combines delicious food with an exhibition space for (new) designers to show and sell their work. Most of the furniture used in Stroop is vintage and also for sale. This gives the café a unique, but still homely feel. There is even a vintage looking radio that is sneakily plugged in to a computer for some nice music (also for sale obviously). Obviously if you come to Stroop you don’t just come for the gorgeous work that is displayed. You come for the food! 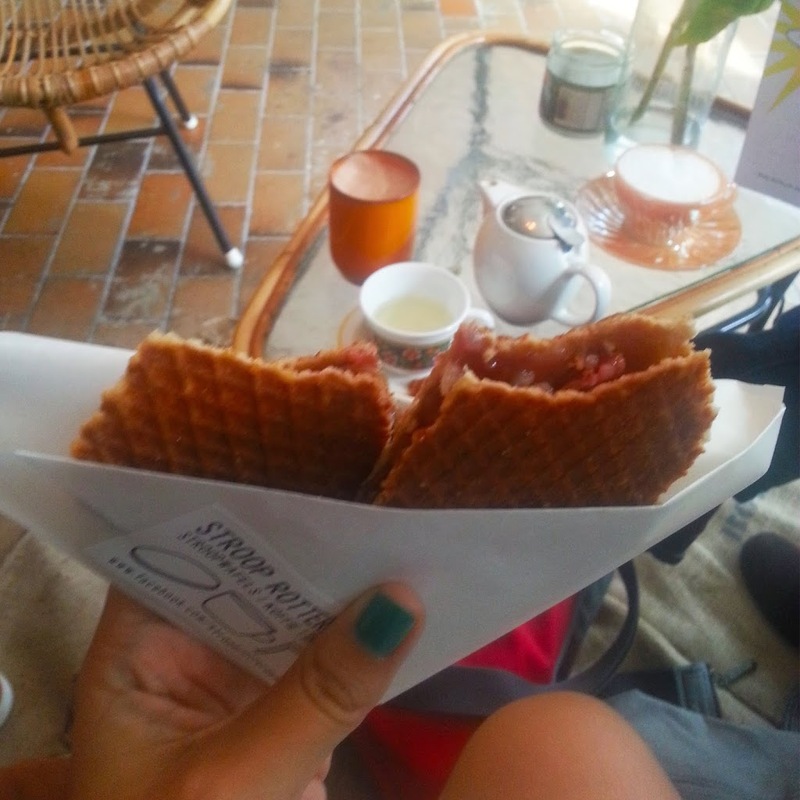 A ‘Stroopwafel’ is a Dutch invention in English called something like a ‘syrup waffle’. It consists of two thin strips of waffle with syrup in the middle. The stroopwafels at Stroop are made right before your eyes. They add all sorts of flavors to the stroopwafel. Every week they have a new ‘special’, when I went there this weekend with some friends they had the ‘Maffioso’ with almonds and amaretto. We ordered a ‘Maffioso’, a ‘VOC spices’ and one with bacon. The Maffioso was quite sweet, but the ‘VOC spices’ was absolutely delicious. I don’t know the exact spice combination added to the stroopwafel, but cinnamon and nutmeg come to mind. The bacon one was also really lovely. I never imagined bacon and syrup was really a good match, but I am finally convinced! Stroop is definitely the place to be for a good great stroopwafel. It has a lovely homely vibe, perfect for catching up with friends. When you’re done eating and drinking tea you can have a stroll through the exhibition space and maybe pick up some nice new things. This was the second time I’ve been there, and if I have the time to come back I definitely will!